I love quick projects. And I love it even more when it's something I can make good use out of. I have been looking for a few days for a cute quilted bag that I can use for my hand sewing supplies. I am going out of town for a few weeks and I really wanted to bring some sewing with me to work on while on the plane. I spotted this pattern online and knew it was perfect. Its called Pick- a-Pocket Purse. You have to sign up for the site but its free and worth it. They have tons of cute free patterns. In fact I found a pattern there to make goody bags as favors for our wedding in a few weeks. (but that's going to be a future post) Here is the bag I made. You can't tell from my picture but the spaces in between the sides and in between the handles are all pockets. Great for scissors and other small items. This was for me for personal use so I decided to be lazy and not change my thread color in my machine. I probably should have and I will for future bags. I also changed a few things they they did not do in the free pattern. The inner layer is not tacked down. It bothered me a little. So I stitched around the top to hold it down and then did a few hand stitches inside to keep it down. It floated around a bit but its better now. It also seemed like the liner was a bit too big as it was really baggy on the interior of the bag. So next time I make one I might make it a bit shorter than the pattern calls for. I am also going to pick up some sort of clasp this weekend to keep it closed when I am not sewing. I think this bag took me about 2-3 hours total to do. Not sure exactly because I did it while cooking dinner and doing laundry. The life of a busy mom. My family loved it and I have had several requests for some more to use as lunch totes. I think for those I am going to get some insul-brite to use to keep things a bit colder. My eight year old daughter has been bugging me to learn how to sew so I am going to have her help me make them. I think it would be a good project for her. That's how easy this bag was! Look at these gorgeous strips I cut a few weeks ago. They are from a fat quarter bundle I purchased from Fabric.com. Actually my wonderful fiance bought them for me. Here they are! 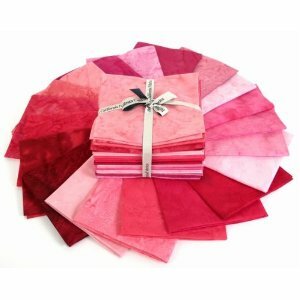 I ordered this bundle from Fabric.com. I just went on the site to link directly to this product and it looks like they might be sold out. :( It is from the Hoffman Bali line and they are handpainted batiks. I don't usually spend this kind of money on fat quarters but they are the prettiest set of fabrics I have ever seen. And they are so incredibly soft. I can't wait to show you what I made with this set of fabrics. But its for a gift and I don't want the recipient to see so I haven't taken any pictures yet. I'll upload them in a few weeks! Lots of progress this weekend! What? A Monday Post? A Giveaway?!? !